A group image of the combined firemen of the Isle of Wight Fire Brigades Federation taken on the day of the annual drill competitions at Church Litten on 16 September 1897. Fireman George Scott passed away on 12 February 1940 aged 68. Unsurprisingly George was born in Newport on 23 April 1872. His parents were William, a dairyman from Chale, and Celia a launderess. Aged 18 he still lived with his family in Newport and worked as a gardener. He shared his home with an elder brother Walter, a mason, and two younger siblings Arthur (16) and Ellen (12). Soon after being recorded in the 1891 Census, George followed his elder brother into the trade of stonemasonry and it was this trade that he plied with noted success as an employee of the Corporation for the remainder of his working life. Around the same time he also joined Newport Fire Brigade. He was one of the firemen caught up in the bungled pay dispute of early 1893 that saw every man effectively dismiss themselves by tendering a mass letter of resignation with the promise of withdrawal if their terms were not met. The feeling in the Guild Hall chamber was hostile to the demand and by the end of February the paid firemen, George being one, were forced to honour their resignations on the same day the Corporation installed the new members of the hurriedly created Newport Volunteer Fire Brigade. However the beginnings of the Volunteers didn't run entirely smoothly and a substantial number quit while the suitability of others was questioned. Around eighteen months later the Corporation were forced to swallow a little humble pie in placing an advertisement in the County Press requesting a number of applicants as probationery firemen and further vacancies for qualified firemen. It being highly unlikely that qualified firemen just happened to have moved to Newport in the intermediate period it is obvious that this advertisement was directed at those previous members of the paid brigade. George was one of the few who evidenced his philanthropy by returning to do on a voluntary basis the role he previously did for pay. Soon after the Isle of Wight Fire Brigades Federation was formed and George became a leading member of Newport Volunteer Fire Brigade's competition drill team. When the town first hosted the event, at Church Litten on 16 September 1897, George was among the Newport team that claimed a home win of the coveted Battenburg Challenge Cup. He may well have been in the Newport team that won it for a second time in 1903 but unfortunately no record was kept of the names of the firemen. 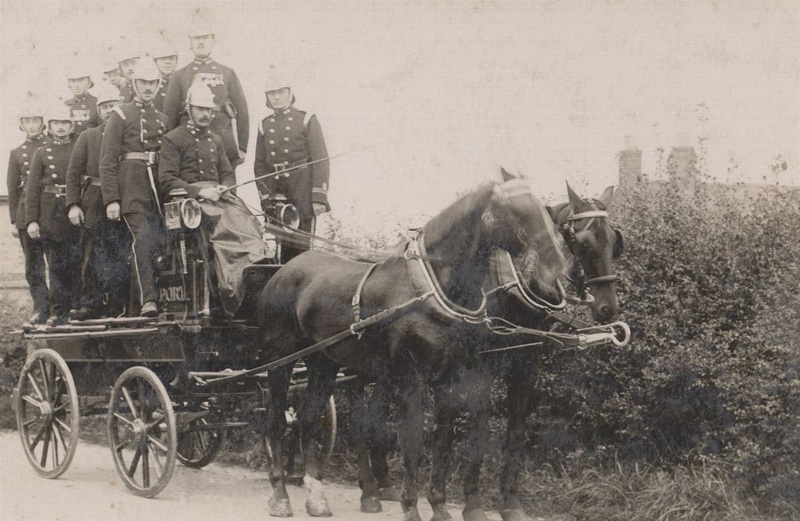 Newport Fire Brigade during the period of George's service. George was a well known and popular sportsman. He was a proficient bowler and batsman for the Newport Working Men's Club and a regular footballer of the Carisbrooke eleven. He was a keen member of the Conservative Club, an ardent student of politics, enthusiastic gardener and lover of flowers. In 1907 he married the elder Annie Thompson of Wiltshire and the 1911 Census evidences them living at 37 Elm Grove with sons William George (2) and Frederick Leonard (1). The household also included step-son Alexander Thompson (11) suggesting that Annie had either been divorced or widowed prior to marrying George. In all likelihood Annie's previous husband had been a soldier as Alexander was born in County Tipperary where the British Army occupied a substantial barracks of around 4000 troops. In 1904, George had been awarded a National Fire Brigades Union 10 year long service medal by the Mayor Mr. C. Salter, at the Medina Hall on 14 March. On 12 April 1908 George was active at the substantial fire that destroyed the Jordan and Stanley premises in Node Hill, a fire of significant interest in the context of the Island's firefighting history as the Newport brigade soon realised the scale of the fire was beyond their capacity and despatched a messenger to Shanklin for assistance. The arrival of Shanklin's Merryweather Gem steam fire-engine was to be the first occasion when an engine of that type was used to fight a fire on the Island. Later the same year the Borough decided to reverse the decision of 1893 that saw the formation of the volunteer fire brigade. Those who sat in Council believed that the firemen's voluntary status was permitting them to act without fear of recourse to the Council and that to bring them into line required the re-establishment of a paid brigade. 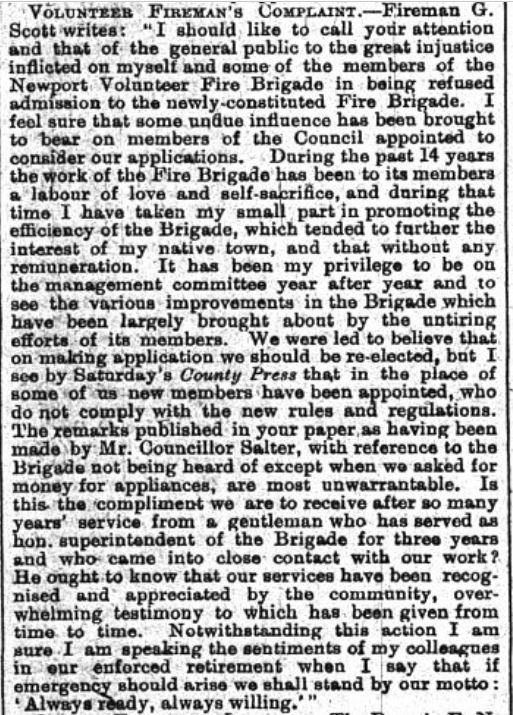 On 14 November 1908 a letter was published in the County Press written by George in which he complained of the manner in which the reconstitution of the brigade was being carried out. A copy of that letter, as it appeared in the newspaper, is shown below. No further direct references to George in the capacity of fireman have been discovered. However on the occasion of his death the County Press correspondent reported that George had served as a fireman of the town for more than 25 years; considering he received his ten-year medal in 1904 the County Press claim suggests that he continued in the reconstituted brigade until at least 1919. Perhaps George's letter was read in the Guild Hall with sympathy. Annie passed away in 1928. From then George and his sons resided with his stepson Alexander and his wife at 21 Mill Street. George never stopped working and had been labouring for a full working day on 12 February 1940. His custom had become to return home, clean up and eat dinner and then retire to the Reading Room at the Seely Free Library where he was known as an avid reader always keen to improve his knowledge of all manner of subjects. At some stage during the evening he suffered catastrophic heart failure and was discovered and checked by Dr Higson who was only able to confirm life extinct. In eulogy the County Press correspondent remarked of George's stonemasonry that the pavements and monuments of the town were testament to his outstanding skill as a craftsman and he had relaid practically all of them. No doubt many examples of his work remain evident in the town today. Rest in peace Fireman Scott.